The first 300K brevet Mary and I rode together was the new Mother of All 300Ks, in 2005. 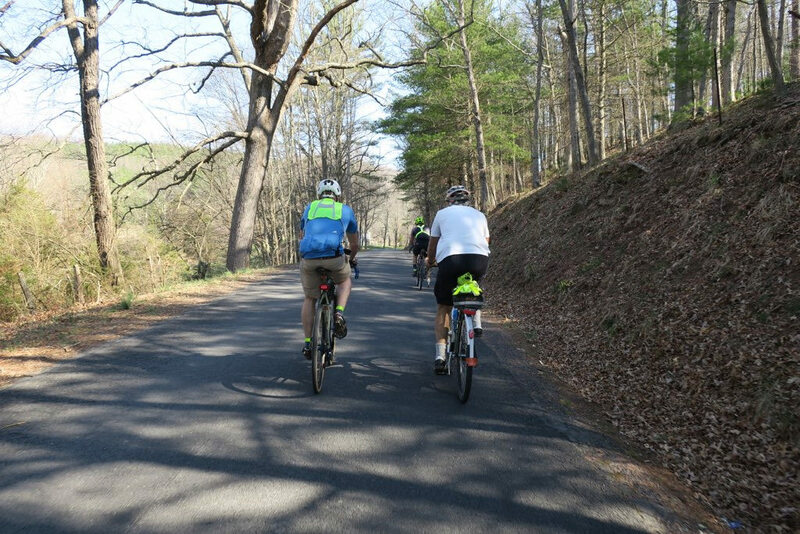 It was the new ride for the D.C. Randonneurs, traversing hilly West Virginia back roads to Lost River, Romney, and the Capon River. Everybody who rode it finished about an hour later or more than other club 300Ks, because of all the climbing: about 13,500 feet of gain over 189 miles, according to Ridewithgps. We joined the club’s latest running of the The Mother on Saturday, and it was as hard as ever. It was also just as scenic, though most of the trees along the way were not yet in bloom. We were the lone tandem among 13 starters. A group of eight of us finished in close proximity around 9 pm, for a 16 hour ride. One fast guy, Mitch Potter, rode in earlier. Rather than post a narrative, here are the main bullet points of the day. Weather: A cool start, then very warm in the afternoon. We left Middletown, Va. at 5 a.m. in the 60s, but it was downright cold on rolling Back Road and then over Wolf Gap. I was glad for arm warmers and my vest. By the time we hit the halfway point around Romney, temperatures rose into the 80s. South winds were a help in the morning, though we roasted on a couple of climbs with warm tailwinds. Wind speeds dropped by late afternoon when we turned south to last miles. Skies were bright and clear all day. Route: This route, by the late Lynn Kristianson, can be described as beautifully brutal. Depending on how you count, it has 11 summits and a bunch of smaller hilltops. It starts out going up steep Wolf Gap into West Virginia and then over Mill Gap. The rest of the day involves quiet back roads connecting one ridge after another in a broad clockwise direction. When you’re not grinding up some long ascending road through farmlands and orchards, you’re hanging on for dear life down a rapid twisty descent, watching for potholes and loose gravel. There are plenty of little granny gear hilltops to grunt over as well. Our top speed was 52.5 m.p.h. into Romney – before climbing straight out of town on Sand Hill Road at 4 m.p.h. That pretty much sums up the day, save for the final 22 miles that trend downward. We were out of the saddle a lot; the balls of my feet ached at times, along with my knees and lower back. We matched our typical time on this course, which felt like a victory. Accomodations: Another challenge is the lack of food and drink services directly on the first half of the route. At Lost River, mile 52, there’s a restaurant a mile away. At Romney, the closest gas station is a mile off route and Sheetz is two miles away, downhill. We weighed going to Sheetz but didn’t want to add another 20 minutes of riding and more climbing. Fortunately the Romney 911 EMS station gave us water and ice. Nice! We all stopped at the Slanesville General Store, mile 109, for lunch and a longer break. Mary and I were famished. The two store controls later in the ride kept us fueled up. 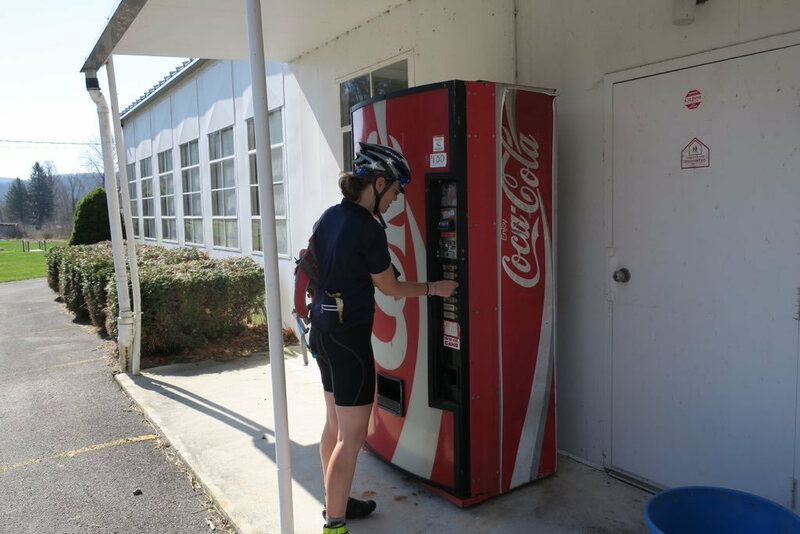 No luck at the Grassy Lick Community Center. Sadness! Equipment: Our Spectrum tandem performed well. The Panacer GravelKing 700c 32mm tires gripped well and I was glad for the strong grab of the Paul Klamper disk brake and Shimano Ice Tech 203mm rotor combination, which got regular workouts. I wrenched just once, to tighten up the headset. We had some wonky shifting a couple of times (my fault, I overtightened the rear derailleur cable) and I dropped the chain once. I also put in the first long ride on my latest saddle, the Berthoud Aspin leather model. It feels nicely supportive, if firm. I had some compression soreness at the end but no chafing. I also had a good experience with the Rapha Classic bib shorts which I started using this winter – just some skin stinging in the warmest hours as the chamois got soaked with sweat. That problem went away as the day cooled off. The relatively thick chamois pad works for me with the Berthoud saddle. Company: We had a good group around us that rode well and kept up the banter. Jesse Kraai of Baltimore gets “The Terminator” award for his determination despite rough going in the heat. Every time we thought he was long behind us, Jesse would ride up to us at the top of a long hill. Way to go, Jesse! John Mazur was enjoying life on his new titanium Ritchey cross bike, as was Roger Hillas on his stunning Colnago. Mike and Dominic, also from Baltimore (I dubbed them the Charm City Duo), rode gravel adventure bikes and brought good spirits to the proceedings. Both of them were on their first 300K brevet. Barry Benson was his steady self, and we were glad to see our fleche teammate Jose Blanco, who at one point wanted to know the number of hills to come. Mary estimated 1,000 – it sure felt that way. And, let’s not forget veteran randonneur Paul Donaldson on his Sam Hillborne with flat pedals. He consistently gave us somebody to chase. He rode the first Mother event with us back in 2005. Thank-You’s: We’re indebted to ride organizer Emily Ranson, who got up in the middle of the night to send us off, and Nick Bull (another Mother original rider) who rode with Emily last weekend on the cold checkout ride. We had good service at the stores along the way, and I offer a special nod to the Romney 911 center for the hospitality. 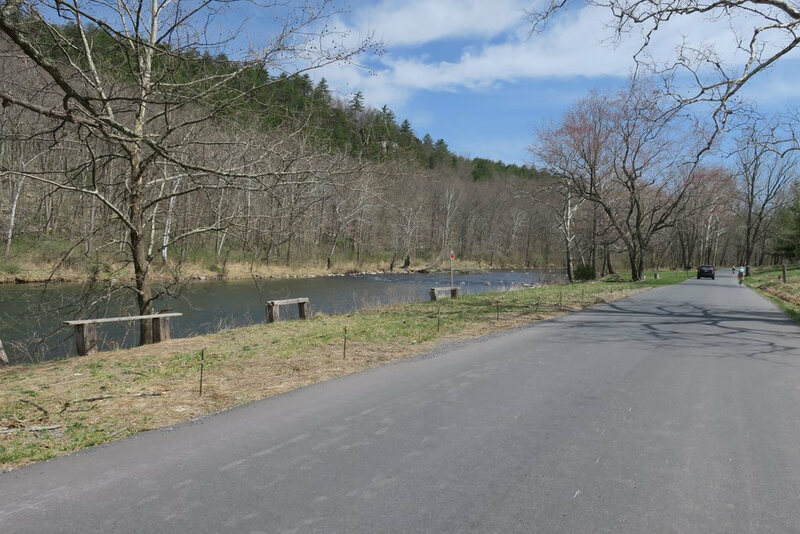 Our next brevet is the DCR 400K on April 28th, as we work to finish our qualifiers in advance of riding the Coulee Challenge 1200K randonnee in Minnesota this August. See my photos from the ride here and Mary’s here, with much better views of our companions, both at Flickr. Our Strava track is here. I love the photo of the pair of geese, that is a great shot. We enjoyed our much shorter ride Saturday enjoying the sun and warmth Friday and Saturday. 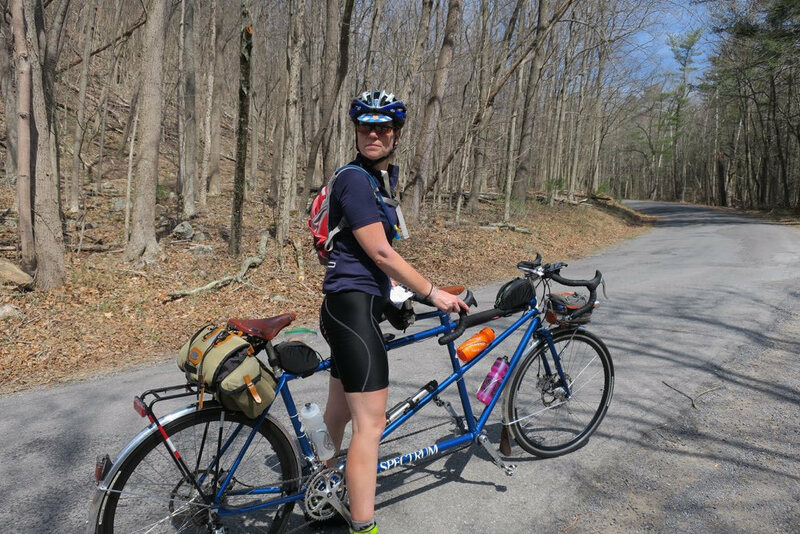 Our tandem team can’t wait for spring to fully arrive in the Mid Atlantic area. Where did you ride? Yay ☀️! Great pics and write up! I keep coming back to look at them. Thank you! And fun riding with you guys. Thanks Mike. Great to ride with you too. Nice bike as well!